The Orphanage and School at Grison-Garde is entirely a product of the hopes and plans of community elders. They saw a need: an orphanage for the growing number of children who lost parents to disease, as well as a school for those whose families could not afford the standard cost of tuition. In 2001, the committee established a board of directors, drew up plans for the project, and received a plot of land donated by their president, Joseph Lionel Bastien. 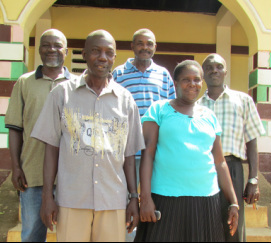 Bastien, pictured front left in the photo at right, asked the Haiti Mission medical team for any help we could offer. We assured him that we would seek sponsors. Enter 93-year-old Robert (Bob) Ford, PhD, of Port Charlotte, Fla., a mathematician, businessman and father of Raymond Ford, MD, the medical director of the Haiti Mission. Bob offered to sponsor the initial phase of construction of the orphanage and school, and with his donation, the project was off and running. In February, 2002, construction began solely at the hands of this Haitian community, providing a source of employment and pride for many. (American contractors visiting the school have called the construction "first class.") The community of Grison-Garde can be very proud of its efforts. It was their idea - they built it, they own it and that's why it works. The Board of Directors is made up of community elders. with the help of the Building Goodness Foundation. All of these efforts are supported by the Robert Ford Orphanage and School Foundation, a non-profit, secular, tax-exempt organization, headquartered in Charlottesville, Virginia. Approximately 96 percent of funding comes from private donations.